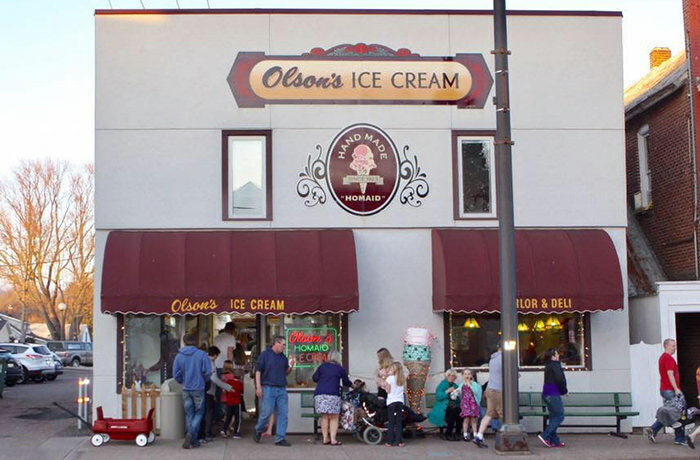 The history of Olson’s Ice Cream is almost as rich as the ice cream itself. 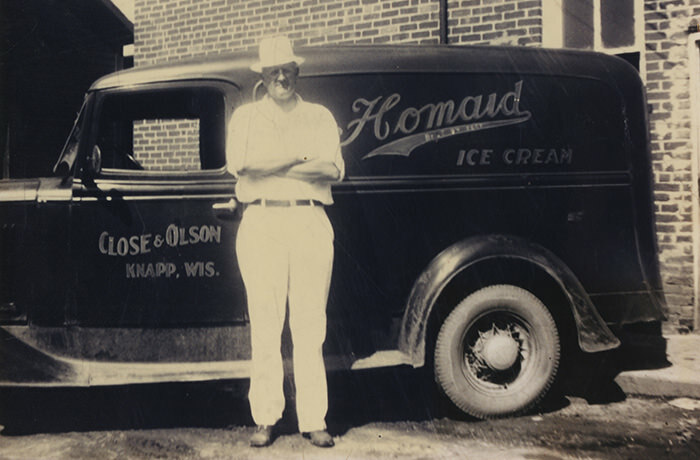 Albert J. Olson and his partner began making their “Homaid” Ice Cream at Knapp Dairy in Knapp, Wisconsin. 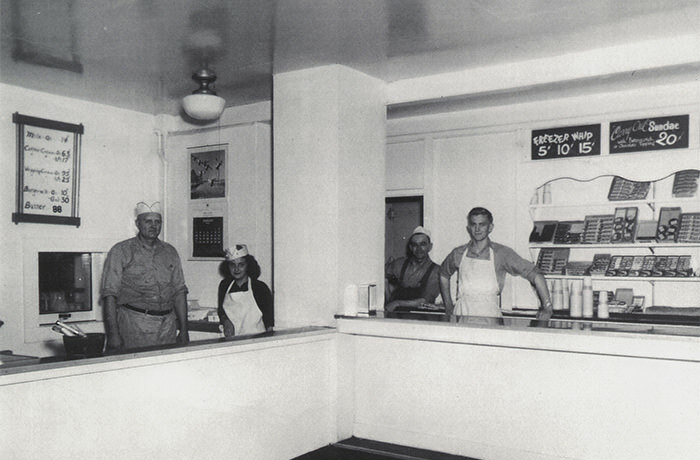 Albert moved his family to Chippewa Falls and began making ice cream and processing milk at Olson’s Creamland Dairy. We are still located in that same building today at 611 North Bridge Street in Chippewa Falls, Wisconsin. The Olson family stopped bottling milk altogether. 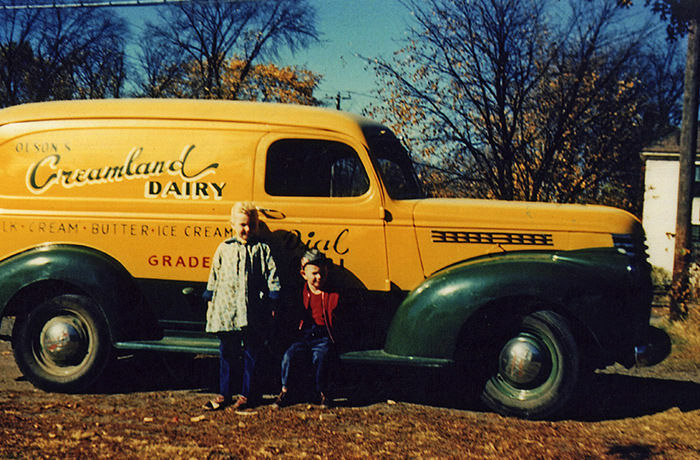 With a penchant for the highest quality, Howard Olson (Albert’s son) worked with another dairy to develop the same ice cream mix his family had made for decades: only fresh whole milk, cream and sweetened condensed milk are used – never any powders or fillers. Howard and his son David sold the business to the Hunt family. Though ownership of Olson’s has changed, it’s excellent reputation built by the Olson’s family remains intact today. The Hunt family continues to produce the original recipes along with an ever-growing collection of new flavors. Olson’s has developed over 150 recipes (and counting!) of delicious homemade ice cream. When you visit, choose from the largest selection of classic and seasonal flavors made with fresh milk, cream and high-quality ingredients. We regularly hear stories from our guests coming to Olson’s since they were kids (even our guests that are 90+ years old). A number of local stores carry our ice cream and it can also be found in several local restaurants and other locations. The Hunt Family has followed in the footsteps of the original owners, The Olson Family, continuing the 75 year tradition of making Artisan-Crafted Ice Cream in Chippewa Falls. They will be expanding to Eau Claire in 2019. Jeremy Hunt has joined his parents, Dan and Linda, as an owner, and is looking forward to managing the local favorite and iconic Olson’s Ice Cream brand into the future. Linda oversees production and has a passion for making the areas favorite, locally made ice cream, while assistant manager, Ingrid Sievers, helps keep things running smoothly at the store, at special events, and behind the scenes. Our passion goes beyond being the best ice cream or local favorite for decades, according to Dan. Olson’s has been and will always be about developing relationships and creating memories. Olson’s truly is a family tradition.